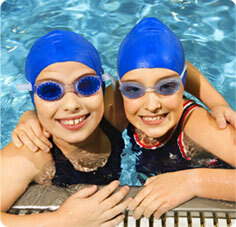 From age 5 through high school, we have an ideal group for your swimmer. 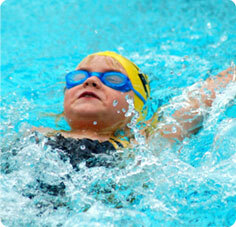 Swimming is a competitive sport, and a life-long activity that contributes to health and fitness. Our team is divided into separate squads to address both the development and commitment of your swimmer. Since kids are involved in many other activities, we offer both once-per-week and multiple-times-per-week options to help parents balance their children's schedules and commitments. And no volunteer hours or fundraising requirements! We focus on building confidence through recognition of individual improvements in practice and race times, rather than place finish. An emphasis on stroke technique and a gradual increase in commitment to the sport will foster a love for swimming, while also minimizing burnout. We prepare our athletes for high school swimming. Often, we have a coach in the water to assist with individual stroke corrections. Our program includes dryland training to build core strength and increase flexibility. Come for a TRY-OUT and see which group is the best fit for your swimmer. First level with an emphasis on stroke technique, swimming one length at a time. Second level. Adds interval training, dryland and stroke drills. Advanced level. Longer practice time with additional conditioning. For swimmers who are committed to swimming as a sport and will participate in USA swimming swim meets. For 8th-12th grade swimmers to prepare for high school season. When the kids are out of school for summer vacation, Daland brings its swim team program to a few area pools. Swimmers that can swim freestyle and backstroke for 25 yards qualify for our Summer Swim League practices and swim meets. 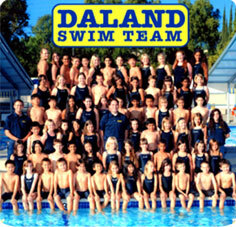 Daland Swim School is excited to provide MIM’s a 4 time a week all women’s team and Dudes 3 times a week all men’s team. These practices are coached and will include interval sets, stroke technique and extra instruction for those who are newer to the sport of swimming. SWIM TEAM GEAR AVAILABLE IN OUR SWIM STORE, ON SITE.